By Tanya Corman--A team of high school students from Eilat – UJA Federation of Greater Toronto’s partner community - has won a prestigious international robotics competition. 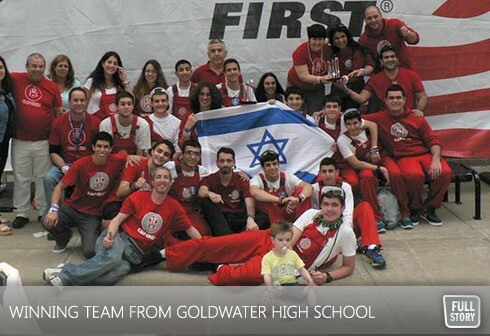 The budding engineers, who all study at the Goldwater high school in Israel’s southernmost city, was awarded the Rookie All Star Award at the annual FIRST Robotics Competition, which as held in St Louis, MO, in May. Some 400 teams took part, mostly from the US and Canada. The competition pits teams of high school students against each other, competing to design and build a robot that can complete a specified task, under strict rules and with limited resources. In southern Israel, the competition is funded by the JFNA Negev Coalition, an alliance of nine North American Jewish communities, which are jointly funding strategic initiatives to address the Negev’s challenges. The competition is an initiative of FIRST (For Inspiration and Recognition of Science and Technology), which was founded in 1989 by the inventor Dean Kamen, and aims to inspire students in engineering and technology. The Goldwater team was chosen to represent Israel after taking first place in the finals of a national competition for high schools, which took place in Tel Aviv in March. Sixteen students from Eilat flew to St Louis, accompanied by their school principal and four teacher/mentors. Indeed, the mayor of Eilat, Meir Yitzchak Halevy, upon hearing about the Goldwater team’s success, said: “I am thrilled, but not surprised. Having accompanied the project from its inception, I have always believed in the amazing abilities of our children and their mentors. The team has brought pride to the young people of Eilat and to the entire city." Explains Chaya Idan, Goldwater’s principal: “The team worked day and night building Eilat’s first homegrown robot. They needed to master electronics, pneumatics, programming and design, to say nothing of teamwork". The team built a robot which can play basketball, which was debuted to great acclaim at a basketball match between Hapoel Fattal Eilat and Maccabi Tel Aviv, playing against legendary Maccabi Tel Aviv player Mickey Berkowitz. In Israel, 52 teams comprising more than 1,500 students are competing in the local FIRST robotics league, which is overseen by the Technion.